NO ONE IS more aware of the value of a brand than Goldman Sachs. The investment bank, founded in 1869, has advised the biggest and best American companies on the value of theirs for the past 150 years. It helped F.W. Woolworth, a pioneering department store, with its initial public offering in 1912. It took Ford and Disney public in the 1950s, helped Amazon buy Whole Foods in 2017 and will take Uber public later this year. Yet these are troubling times for its own brand, tarnished by association with a fraud-ridden Malaysian state-run fund, 1MDB, and hurt by the bank’s failure to adapt after the global financial crisis. The first task for David Solomon, who took over as chief executive last October, is to clean up Goldman’s reputation. In 2012 and 2013 it helped 1MDB raise $6.5bn across three bond offerings, earning $600m in fees—way above the norm for such work. American and Malaysian authorities have alleged that much of the money raised was stolen in a scheme masterminded by Jho Low, a Malaysian financier. He has denied wrongdoing (and vanished). Last November America’s Department of Justice (DoJ) announced that a former senior partner at Goldman, Tim Leissner, had pleaded guilty to conspiracy to launder money and to violate foreign bribery laws. And they indicted Mr Low and another former Goldman banker, Roger Ng, who has also denied wrongdoing. Goldman claims that Mr Ng and Mr Leissner, who transferred embezzled funds into his personal bank account, kept the bank in the dark about their actions. But criminal charges have been filed against the firm in Malaysia. Though Goldman is contesting the case, it is spooking shareholders, who worry about both onerous fines and what it implies about oversight at the bank. Since November its share price has underperformed an index of other bank stocks by 10.3 percentage points, suggesting that the scandal may have wiped as much as $9.1bn off its value. It is against these headwinds that Mr Solomon must try to convince investors that Goldman can reinvent itself. Its peers have already digested the fact that Wall Street’s traditional model, in which banks advise on huge corporate deals and make bold trades on their own behalf, has become less profitable. According to Michael Spellacy of Accenture, a consultancy, 90% of the economic profit made in the capital-markets industry is now earned on the buy side—that is, by those who manage assets or investments—and just 10% from sell-side investment-banking activities. A decade ago, he says, that split was closer to 50-50. Goldman’s slowness in reacting to these structural changes has allowed its competitors to catch up. In 2010 its return on equity (ROE) was 11%, easily beating the 8% average for “bulge-bracket” American investment banks, a group including JP Morgan and Morgan Stanley. But last year that group averaged an ROE of 11.2%, placing Goldman, at 12%, near the middle of the pack. And investors are becoming concerned about the way it earns its returns. Volatile profits, like those from trading businesses, mergers and acquisitions, are considered less valuable than steady fee-based income, for example from wealth management. In 2016 Mr Solomon’s predecessor, Lloyd Blankfein, took the first steps towards a new strategy by launching a consumer bank, Marcus. In 2017 Goldman announced a target of increasing yearly revenues by $5bn by 2020. But the focus on expanding consumer lending, which offers a relatively low return on investment, did not impress shareholders. They have had a rough ride. Holding shares in the firm since 2010 would have earned just 13% (without adjusting for inflation), compared with an average of 71% for its bulge-bracket peers and 152% for the S&P 500. Goldman continues to trade at just 0.9 times its tangible book value, a measure of the money that might be returned to shareholders if it were liquidated. The average ratio of price to tangible book value for a bulge-bracket bank is 1.15. As far as 1MDB is concerned, the big worry for shareholders is the size and scope of the penalties. A large fine is all but inevitable. It could be based on the $600m Goldman earned from the bond issuance—or the $2.7bn American authorities say was stolen from the proceeds. That will be multiplied by anything up to four, depending on the degree to which the firm is found culpable. That Goldman is co-operating with the DoJ will bring the multiplier down; if the DoJ decides the firm’s oversight of compliance procedures was inadequate, it will be towards the higher end. Steven Chubak of Wolfe Research, an equity-research firm, thinks the total will be somewhere between $1bn and $4bn. When it comes to the required shift in strategy, however, Goldman’s efforts may soon start to bear fruit. Its expansion into consumer businesses is continuing apace. In 2018 it acquired Clarity Money, a personal-finance app. Last month Tim Cook, Apple’s chief executive, announced that it will launch a credit card with Goldman this summer. When Marcus launched it was as a consumer lender; since then it has added deposit-taking. Though it offers market-leading rates, deposits are still a cheap source of funding. In 2012 just 8% of Goldman’s funding came from deposits. Last year that share had risen to 19%. If it can keep replacing wholesale funding with deposits at the pace of the past five years, says Mr Chubak, it will have reduced funding costs by $500m by 2022. The consumer space is not the only place Goldman is rolling out new technology. More than a quarter of Goldman’s employees are now engineers, says Heather Kennedy Miner, the bank’s head of investor relations. The firm has deployed a new platform, called Marquee, for institutional investors and will expand into corporate cash management in 2020, which will further increase low-cost deposits. The firm also seems to be planning an overdue restructuring of its fixed-income, currency and commodities (FICC) business. Revenues earned from FICC have fallen from $13.6bn in 2010, accounting for more than a third of Goldman’s revenues, to $5.9bn now, or just a sixth. Last October Stephen Scherr, Goldman’s newly appointed chief financial officer, announced a review of all its business lines, which will be published early next year. In February the Wall Street Journal reported that the commodities business would be scaled back. (Mr Scherr emphasises that Goldman has no plans to abandon commodities entirely, as some of its competitors, including JP Morgan and Morgan Stanley, have.) In March Mr Solomon announced plans to cut the number of staff in sales and trading by 5% this year. Its new strategy will mean Goldman is competing on less familiar territory. Consumer deposits and corporate cash management are competitive markets that JP Morgan and Bank of America have dominated for decades. But they are also huge markets. Even a small slice could have a big impact on Goldman’s profits, says Mr Scherr. 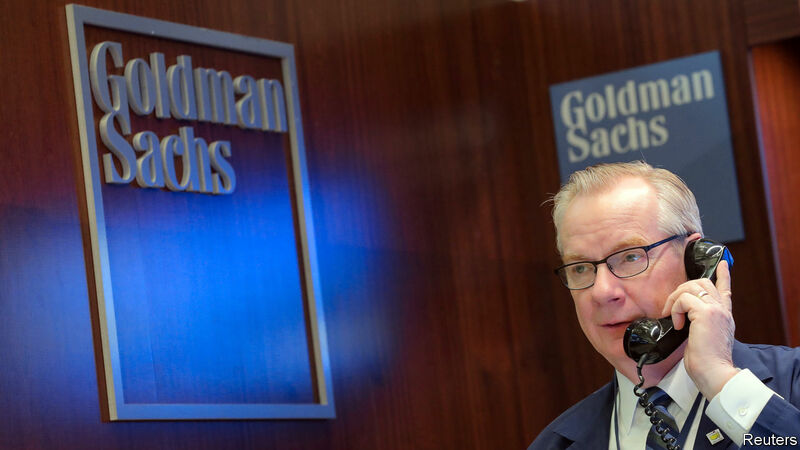 Compared with established banks, Goldman is able to develop and deploy new technology easily; but unlike startup digital competitors, its innovations are backed by a $925bn balance-sheet. America’s financial-services industry has been slow to adapt to technological change. An old bank with a new direction might be well-placed to disrupt it.